Failure is not when we failed, but when we have accepted it to be a part of our life. And we crash so loud and accept defeat with all hope lost and dashed to the winds, thinking not of a second chance or retry. I give up is all left to say. The ideology of Failure can be subdued, it can be erased from ones dictionary, but not if that person is willing to overcome its tentacles with the “You Can!” conviction. Many people have been successful in their life endeavors but slight ignorance made them crash with loud thuds. Since no one can comfortably predict how his/her life will end, it will be wise if we take precautions, because life is full of experiments. 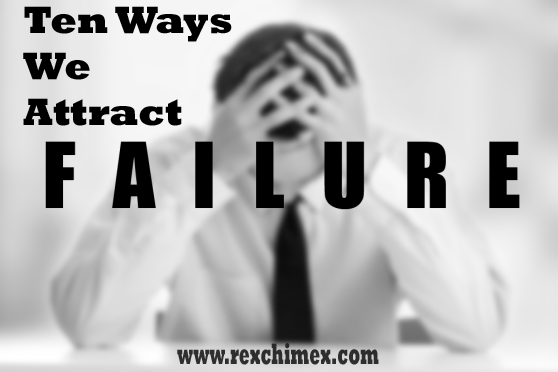 There are several ways, man can attract failure to themselves and we are going to look at 10 ways that can possibly happen. Procrastination is the act of postponing, delaying or putting off issues needed to be attended to intentionally or habitually. Students who procrastinate, and keep modifying their reading time table to make way for frivolities of life, tend to fail exams. Christians who procrastinate on reading the good book bible, often see themselves doing things not supposed, dwelling in sin. Teachers who procrastinate on educating their students, by rescheduling the days of teaching, might eventually produce half-baked students. Another says – make hay while the sun shines. Time is free, but it’s priceless. You can’t own it, but you can use it. You can’t keep it, but you can spend it. And once you lost it, you can never get it back. Avoid procrastination. – For time and tide waits for no one. When things happen as we would not accept, it’s the nature of man to complain and probably blame others for their ill fate. But complaining and blaming never solved problems or lead to breakthrough and success. The only thing complaining and blaming does is to convince other people that you are not in control and then make you vulnerable. Complaining is finding faults. Wisdom is finding solutions. As you breathe right now, another person takes his last. So stop complaining and blaming, and learn to make out the best with what you have. Once you learn how to manage your complaint and blaming, then you will be able to see clearly and find solutions to your problems. Avoid incessant Complaint and Blaming. Stinginess is when someone is unwilling to spend or help others when necessary when it’s obvious that they have all it takes to render help. Lack of generosity. Most people who are stingy are in constant fear of poverty or lack. They believe that keeping all to themselves makes them infallible. Also some people don’t give because of several numerous reasons that may not be reasonable at all. But no one ever became poor by giving. Trust allows you to give. Giving is abundant. As you give so it shall be given to you. If you give with judgment, limitation and stinginess that is what you will create in your life – judgment, limitation and stinginess. We make a living by what we get, but we make a life by what we give. Only by giving are you able to receive more than you already have. No act of kindness, no matter how small is ever wasted for we rise by lifting others. What I spent, I had; what I saved, I lost; what I gave, I have. Avoid Stinginess. – blessed is that hand that gives. By avoiding the 10 points listed above, one will probably live a successful and happy life. Try it today and watch as everything turns around for your good.